Omsk, Russia. 17th August 2014. 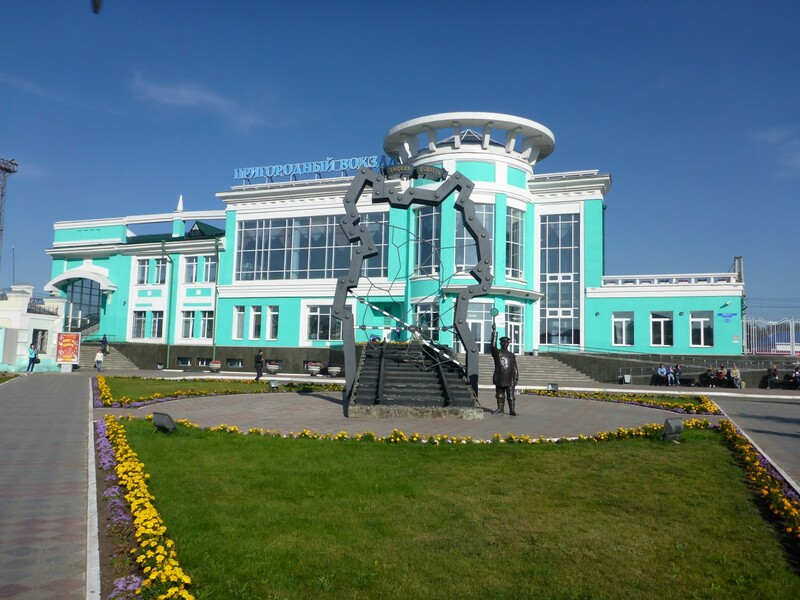 I spent nine days in Omsk waiting for Kazakh post to bother themselves to deliver my package. What a waste of time and money. I had investigated using a courier service to get it delivered but chose the cheaper option, in my ignorance. Well, this time ignorance was not bliss. It was frustrating, expensive and pointless. I probably spent as much in accommodation as I saved on courier fees, maybe more. The bigger cost was in time. Two weeks delay. But there was nothing I could do. My time there wasn’t totally wasted. 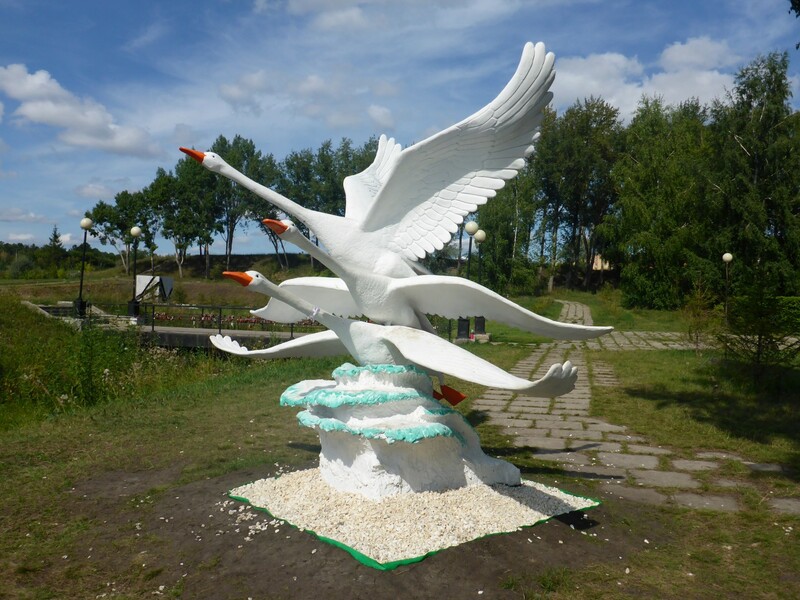 I went for a look around Omsk. The city has a bit of history. 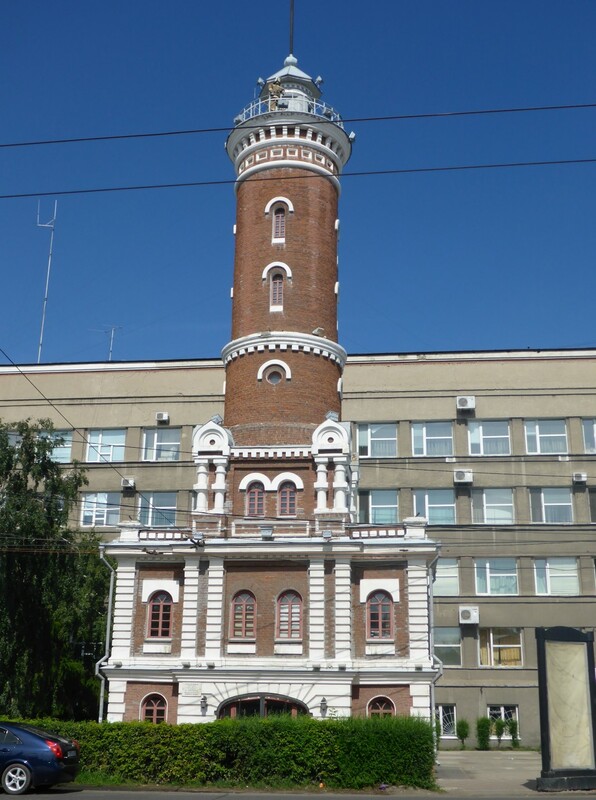 It was founded in 1716 as a military base and was, for a brief period, the capital of Western Siberia. Now, it’s a bustling city of 1.1 million people. The transport system is good, with buses, trolley buses and mini buses, which seem to swarm all over the place like bees around a hive. Some of the mini buses are quite new, others fit into the ‘on its last legs’ category. I’m guessing many of the drivers are self employed. They’re all licensed though and clearly provide a crucial service. I caught a trolley bus into the city. The typical layout of Russian cities means that the streets can be very long. The hostel was about two thirds of the way along Karla Marxa Ulitsa, at number 84. Number 2 is about 3kms away, towards the city centre. I was glad I decided not to walk! At RU18 for the fare it would have been daft not to take it anyway. Something to do with the fire service. The city centre had a few interesting old buildings to gaze at but nothing particularly inspiring, just pleasant. 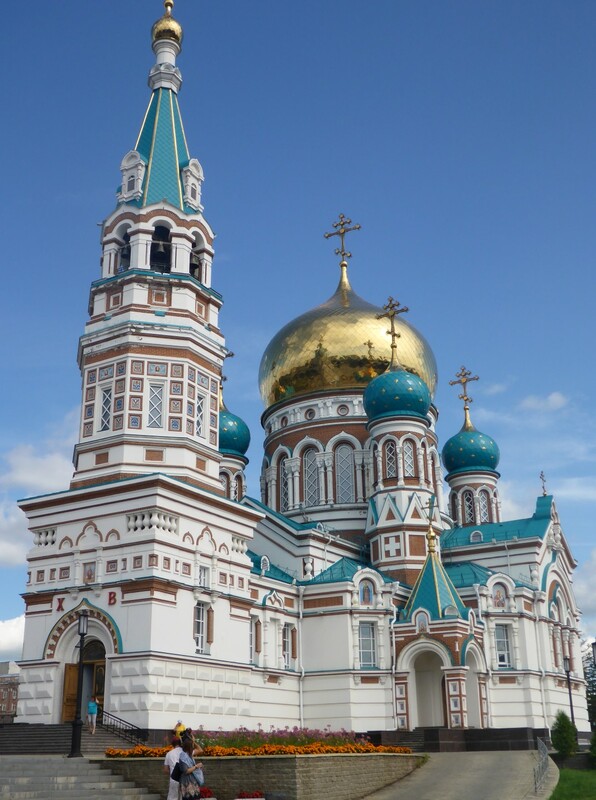 The Orthodox cathedral had been recently rebuilt, the original one having been ‘Stalinised’, i.e. torn down. I was disappointed to see that on the iconography inside all the faces were white. They’d caught the Catholic disease. I went for a walk up one of the city’s long streets looking for some old wooden houses mentioned by Wikipedia, original and rare, from the 18th century. After a long hike, to where the road was lined more by trees than buildings, I gave up. I’d passed several parks on the way and went into one to sit and eat some lunch. 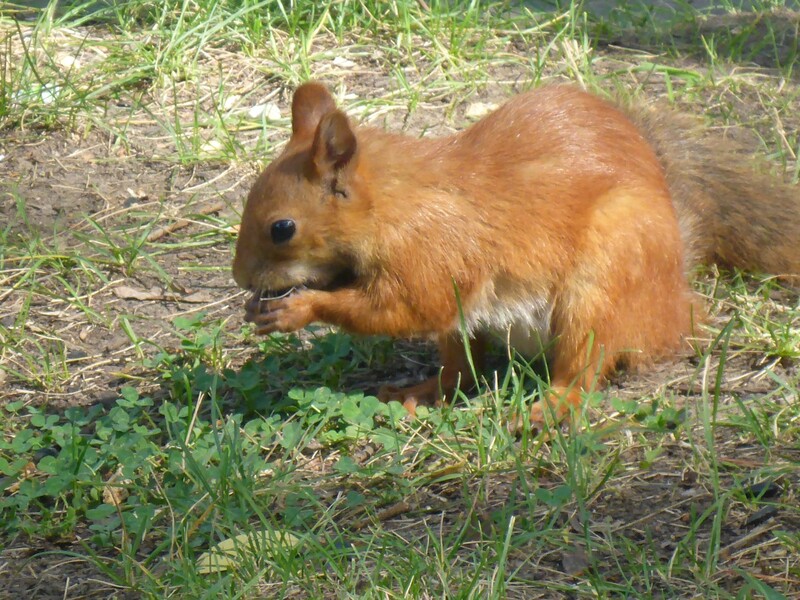 I noticed some people looking at something and realised it was a Red Squirrel. He seemed quite unfazed by the people watching him and ran about quite happily for a while. I was pleased to have got some great photos as I think it’s the first one I’ve ever seen outside of captivity. 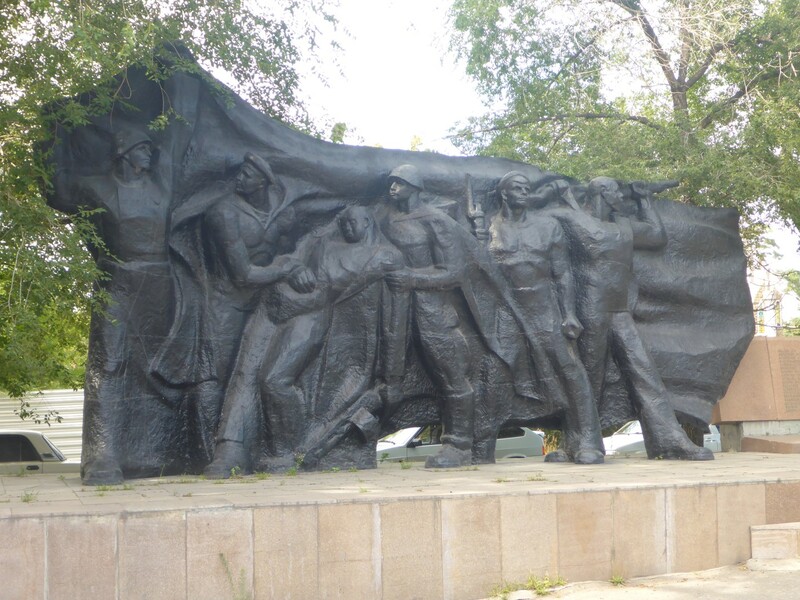 I walked back towards the hostel, across the river, and found a park with the usual Soviet style war memorials in it, including statues to various people. Some kind of heroes’ square. Typical Soviet style war memorial. I was just about to catch a bus back when I noticed a side street that seemed to have some interesting buildings in it. The street was pedestrianised and was named after a Kazakh, Chokan Valikhanov, who had become a national hero. He had been sent to a Cossack military training school as a cadet and had risen up through the ranks. He became very prominent in Russian/Kazakh diplomatic relations during the 19th century, as well as being an explorer of some note, but had died of TB at age 29. By then he had become a Kazakh national hero. Not only was the street named after him but it was also the location of the Kazakh consulate. The buildings there were older than most in the area so made good photography subjects. 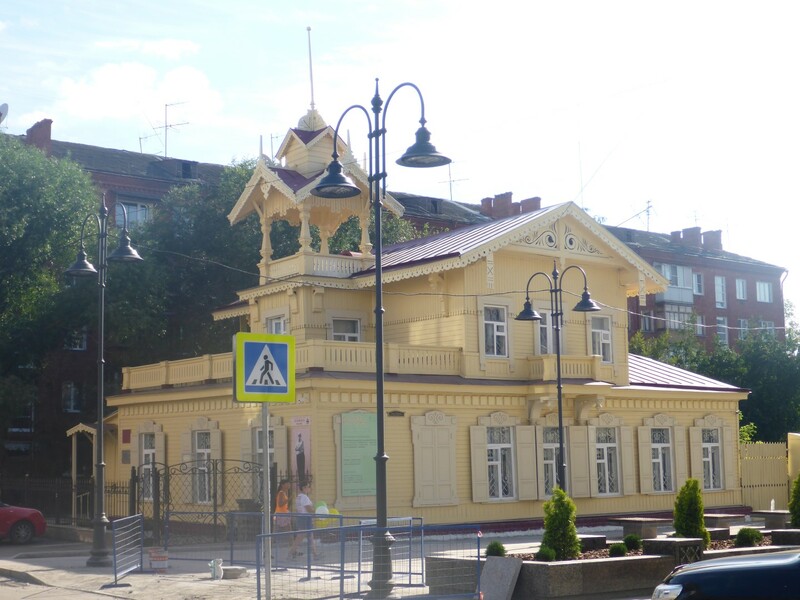 Old style Siberian building, all wood. A number of interesting people passed through the hostel while I was staying there. Tanya is a student at Novosibirsk university and was in Omsk for medical appointments. She speaks good English and was chatting to me about my travels. She wanted my blog details, which I was pleased to give her. She gave me her phone number, insisting that I contact her when I visit Novosibirsk. Another one was Gali, a woman in her fifties from Ulan Ude. She was here to help her seventeen year old son settle in to the university, it being his first time away from home. One evening she was berating me for spending so much time inside so I said to her ‘OK, let’s go for a walk – right now!’ So we went for a pleasant evening stroll down by the river, which made a pleasant change from staring at four walls and a computer screen. Eduard, a guy in his fifties who was in my dorm, made some soup one evening, which we all shared. Another guy came in one evening with a huge watermelon, which, again, we all shared. Typical acts of Russian generosity. I thought I ought to contribute to this virtuous circle so whenever I visited the supermarket I would bring back a big bar of chocolate, break it up and leave it out for people to pick at. Sacha, the young woman who ran reception, was very helpful to me. She split her time between the hostel and studying tourism at the university. I needed to post a form back to each of the two credit card companies regarding the illegal usage. She brought me in a couple of envelopes, which I addressed in the usual British style, and went across to the post office. I had practised the phrases I thought I’d need, such as ‘Airmail’ and ‘First class’. I was wasting my time. I offered them to the clerk and she made it clear that I’d filled the envelope in wrong. I was supposed to put the address on the small lines provided rather than write it in large letters across the middle. An English speaking woman in the queue behind me explained it all to me and suggested I bring a Russian speaker with me when I came back. So I bought two more envelopes and left with my tail between my legs. Sacha came to the rescue, offering to come back over with me. We filled out the envelopes properly and tried again. The other woman was right when she said I would need a Russian speaker as there were plenty of supplementary questions to be answered. I then learnt that they were likely to take at least a month to get to England, maybe even two. Russia Post is a bit of a standing joke apparently. By way of saying ‘Thanks’ I bought a couple of Lotto tickets and gave them to Sacha. Top prize, one million Roubles. Worth about £20,000 in the unlikely event that she won. She seemed pleased though. A woman named Inna came to the hostel one day. It transpired she and Sacha are friends and both are from Kazakhstan but of Russian origin. It seems that people who can only speak Russian are finding it much harder to get meaningful work in Kazakhstan since it became independent, so they returned ‘home’. They need to be able to speak Kazakh too, which struck me as being quite fair. Inna now owns three hostels in Omsk, Hostel Millenium being the cheapest. It gets a lot of its business from the station, which is just across the street. There were several occasions when people would arrive late in the evening and leave early in the morning. The station is on a north/south and east/west junction so I assume these people were changing trains. She asked me what I thought of her hostel and I was pleased to tell her how clean and tidy it was, with nice staff who seemed to spend half their time cleaning the floor. She had decorated the whole of the place with tiling, making it very easy to keep clean and fresh looking, and no doubt long lasting too. 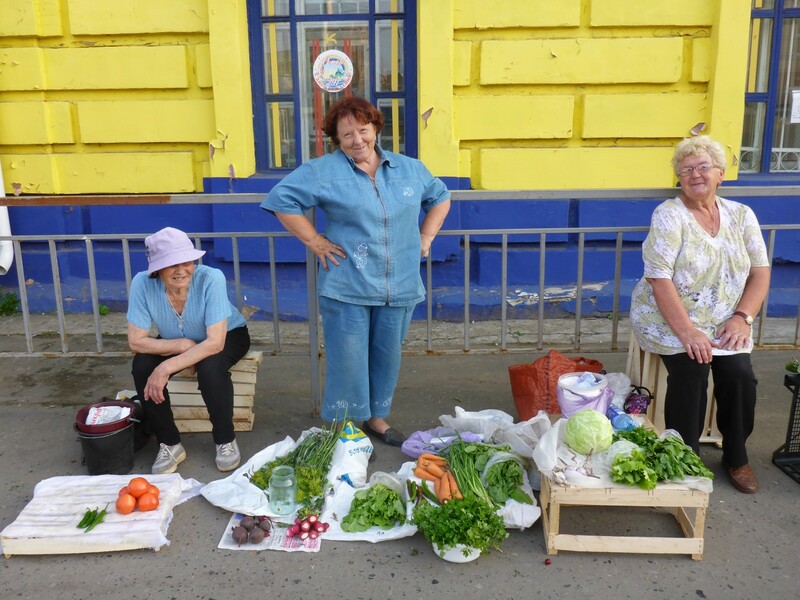 Local ladies pose for me. The area of the city where the hostel is located is a bit run down – typical inner city in many ways – but has plenty of shops around. There’s a large 24 hour supermarket just down the road and across the street is a nice cheap café which serves up food canteen style. This was very useful as I could just go to the servery and point at what I thought looked nice and it would be served to me. I never paid more than RU200, usually a lot less, and that would include soup, a meal, a cake and a drink. Very reasonable, especially compared to the KFC I went into the day I arrived where the meal cost twice as much and didn’t even fill me up. Typically splendid Russian station building. Just to make me feel really at home back in Russia, Sacha asked me one day if it’s true that the English drink tea every day at 5pm. As time went by I had been keeping an eye on the tracking website for the progress of my package. 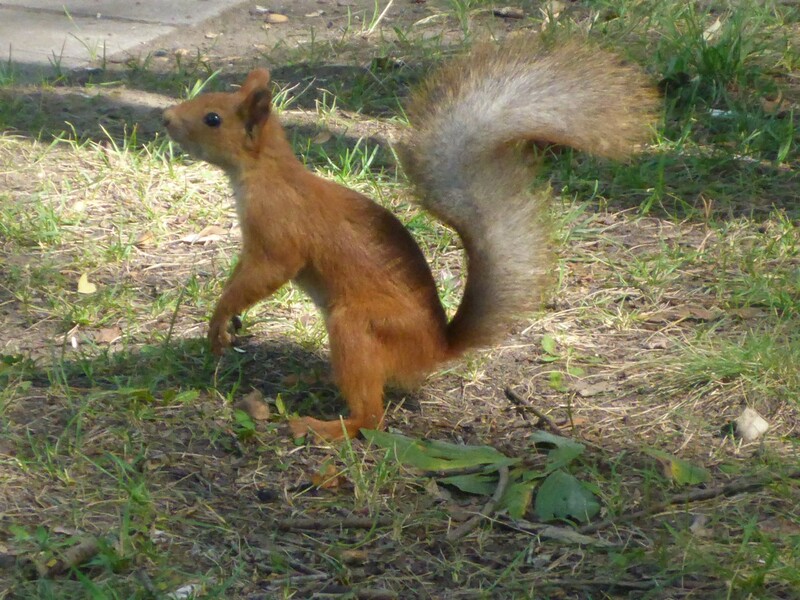 It had arrived in Kazkahstan on the 12th August, I learned, having been posted on the 8th. It was in Almati. All it had to do was get to Astana and then get delivered. And, wonder of wonders, I finally heard from Diaz to say it had arrived. Hooray! This was on the Wednesday of my second week in Omsk. Diaz was going away for the weekend after work on Friday so I made plans to ride back to Astana on Thursday and meet him Friday morning. I asked him to ring the hostel I’d stayed at before to book me in for Thursday and Friday nights. I’d be gone on Saturday. I wasn’t planning to stay too long this time. When I went down to start the bike before leaving it wouldn’t go. Ten days of inactivity and she didn’t want to start. While I was fiddling about I noticed one of the bolts securing the pannier frame was loose, presumably from when it was repaired. If Doris had started straight away i wouldn’t have noticed that and it would have led to problems, especially on the Kazakh roads.. She was looking after me again. I had to take the pannier frame completely off to sort it out and once I’d done that she started up. Strange, but that’s how these things go sometimes. 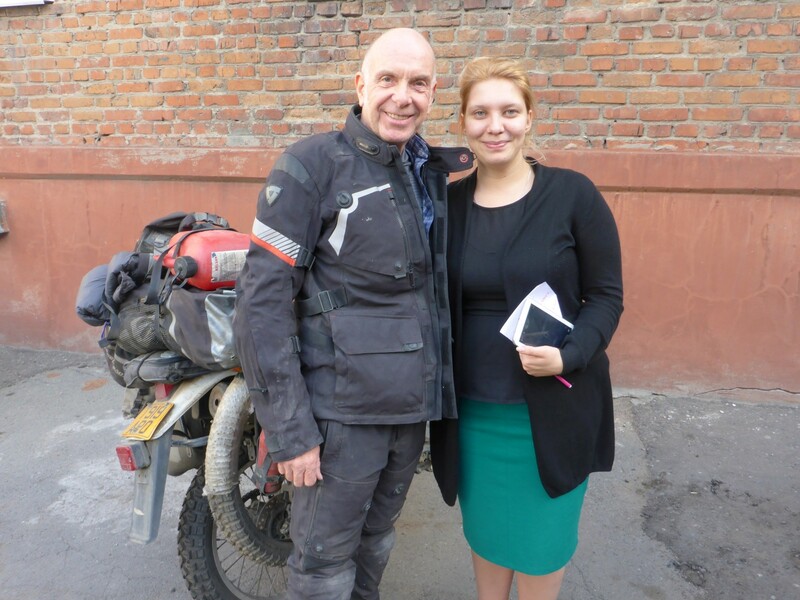 I took photos of, and said goodbye to, Sacha and her colleague and set off, Astana on my mind. The run to the border was quick and easy. Through both sets of border controls easily. The woman at the Kazakh side took the trouble to explain the new fifteen day visa system to me. I asked her if I needed to register. She said ‘Yes, within five days’. So no room for doubt there then. As far as I can work out, if you arrive at an airport they’ll register you at the time so it seems we road travellers lose out. Anyway, I wasn’t planning to be in the country longer than three days so I wasn’t too bothered about it this time. Crossing the border put the clocks back an hour so I regained what I’d lost in repairing the bike. Very handy. The roads were clear and I kept a good pace. After a while I noticed that my fuel can had slipped down off the back and when I stopped I realised it had been hanging down by the exhaust outlet which had melted a hole in the can. I sweated a bit seeing that, wondering if it could have burst into flames. I think not, given that three of the five litres had already gone, although had the engine backfired for any reason it might have been a different story. I put the remaining two litres or so into the fuel tank and carried on, annoyed now that I had to buy yet another can just before I was to enter Mongolia, where I would definitely need it. The rest of the ride went pretty smoothly except that it started raining. That turned those dusty roadwork diversions into a far more exciting mixture of dust and water, or mud as it’s better known, but at least I was riding them in daylight this time and they didn’t seem quite as bad as before. It was dark by the time I reached Astana, 800kms having passed beneath my wheels. I found my way to the hostel easily this time and went up, only to find there was no room at the inn. Diaz hadn’t rung them and they were full. I twisted the young lad’s arm a bit and he said someone was leaving at 3am and I could have his bed once he’d gone. Good enough for me. In the end I slept all night on the couch in the kitchen/diner. Despite the lack of a proper bed he still charged me the same rate as before, T2,000. In theory I was supposed to go to another hostel on the Friday but the lad hadn’t bothered to arrange it so I just stuck around. Diaz rang me and we arranged to meet outside the hostel at midday. He had rung the hostel earlier in the morning to book a bed for me, which was great except that he was 24 hours too late. He’d thought I was arriving on Friday. At least he tried and I was grateful for that. But at last I had my package, with new credit cards, a new driving licence and a new international SIM card. The SIM card previous company had been pretty useless, taking every opportunity to overcharge me and then having a faulty website, preventing me from topping up anyway. So they got the sack. I arranged to meet Diaz at his new shop later on to have a look at it. It took a bit of finding as it was typically tucked away under an apartment block. Everyone was busy organising the new stock. Diaz had a couple of partners in the business and it all looked pretty well set out. He had to rush off to catch a train to Almati so we didn’t get long to talk. That was one of the downsides of my visit to Astana. Diaz is very busy and we didn’t get a chance to socialise properly, which was a great shame. There were many things I wanted to ask him about. Maybe another time. 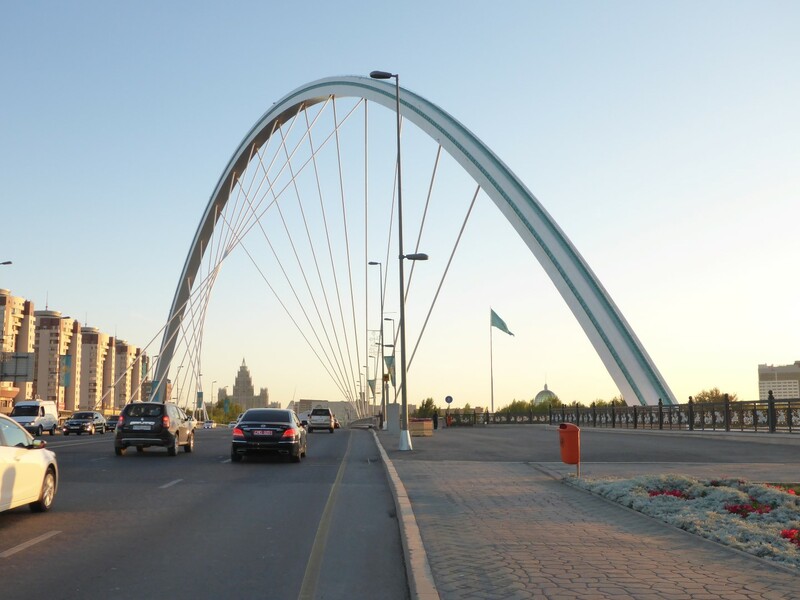 Fantastic road bridge in Astana. I had spent the afternoon planning my escape, I mean exit, from Kazakhstan and had a route pretty much worked out. That night I twisted the arm of the lad at the hostel once more to let me sleep on the couch in the kitchen again. He agreed, and I settled down there. Shortly after, a guy came in wanting to watch a late football game. He said I could have his bed instead. That was fine by me, much more comfortable and quieter too. I was up before 7am and away by 8am. I had to wake up the young lad to organise the lift for me and, of course, he remembered to ask me for money. Because I’d actually had a bed after all I felt I was due to pay something but I knew it was going straight in his pocket so I told him I’d split the difference with him and gave him T1,000. Off I went, an easy run out of town, taking care to avoid the early morning speed traps. The route to the border was on long, straight, empty roads which passed through very few towns apart from the city of Pavlodar. This was my last ride in Kazakhstan, probably the last time I’ll ever be in the country and, needless to say, I got pulled up by the police. I couldn’t ride around this guy, as had been my intention, because he was standing in the middle of the road waving me in along with a car. He asked to see my registration document and when I took it out he unfortunately spotted my Kazakh bike insurance certificate. Double unfortunately he asked to see it and immediately realised it had run out. I’d paid for one month when I crossed the border for the first time, which would have plenty had I stuck to my original plan and not diverted to Kyrgyzstan. I’d actually forgotten all about it. But now I wasn’t dealing with a simple speeding offence which I would have done my best to talk my way out of. Over to the car and the guy in there took great delight in showing me that the No Insurance offence was at the top of his list of motoring crimes and had the largest fine. He wasn’t interested in my Tienge, demanding dollars or rubles. I pulled out two RU1,000 notes and I could tell by the delighted look on his face that was far too much. He indicated I should put it in the storage box under his arm rest and turned away to talk to someone else. I put one of the notes in there and kept the other one. I reckon I could have got away with smaller notes as his attention was distracted but I didn’t have any to hand. He checked I’d put money in there, gave me back my documents and I exited the scene as quickly as I could. The RU1,000 it cost me was the same as I had paid for a months insurance when I first came to Kazakhstan so I suppose you could say it was all even in the end. But what stuck in my craw was that the money went to a thieving policeman instead of a legitimate businessman. The rest of the journey to the border was straight forward except for getting lost in Pavlodar. I was following signs, which then disappeared. Following my compass wasn’t helping and eventually I stopped to ask a guy for directions. His English speaking son was with him and they told me to follow the car while they led me out of the city and on to the road I needed. The final act of Kazakh kindness, one of many I’d enjoyed. Bad followed by good once more. At the border I got out of Kazakhstan easily but the Russian customs gave me a bit of a looking over. A guy came out with a sniffer dog and was testing various parts of my bike with some kind of drug tracing equipment. He’d wipe various parts with some kind of tin foil and then test it with a piece of detection equipment. Another guy got me to open various bags for him to look into. Most unusual but I suppose it was to be expected sometime. As I came in to Russia I was a bit low on fuel, with no spare can now. A guy there told me it was 30kms to the next fuel supply and I didn’t think I had enough for that distance. In the end the border town of Kalunda was only 15kms away and I made it there OK. Petrol for Doris and food at the café for me. All I needed was a place to sleep. A couple of young guys in the café told me there was a hotel in the town and kindly offered to lead me there, which I gratefully accepted. I asked for a safe place to leave the bike. ‘Allah will look after it’ said one of the guys. ‘Allah might look after yours’ I thought, ‘but I prefer gates.’I was happy to pay a few extra rubles for secure parking round the back of the hotel. 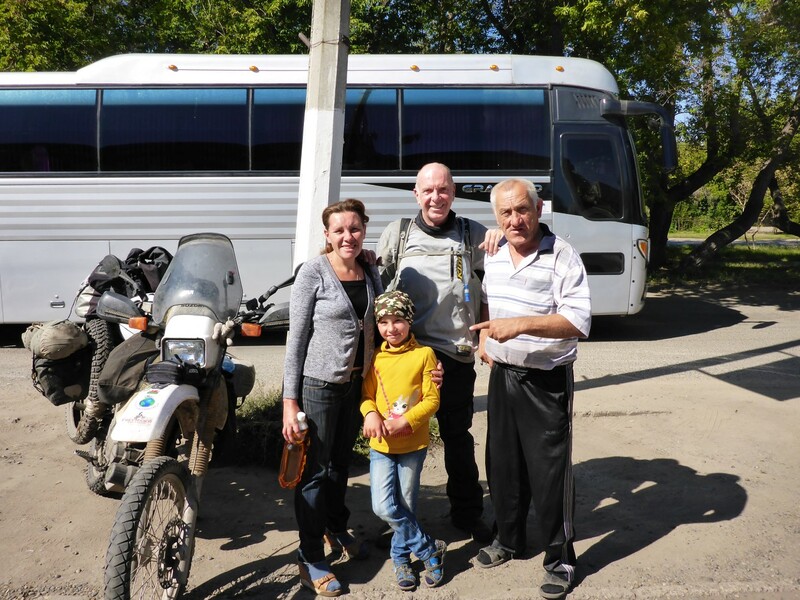 The next day I had a really nice, gentle, sunny ride across country to Novosibirsk. GPS was trying to send me via Barnaul but my map new better and I ignored the GPS instructions to turn around and go back. After some time the GPS recalculated the route and promptly reduced the journey by 200kms, far more than I’d actually ridden at that point. How weird is that! Before leaving Kalunda I drove around looking for an ATM. While doing so I came across a Sunday market, rather like a boot fair. The site was designed for this activity as it had concrete and steel counters laid out in rows, some of them numbered. Very well organised and I guessed it was another hang over from Soviet times. I stopped in a small town en route to get some supplies and when I came out of the shop an old guy, his son, son’s wife and their son were all looking at the bike. They wanted to take photos so we all posed in various ways before I got back on and left, everyone smiling. I love those little moments. Friendly people who make the moment. 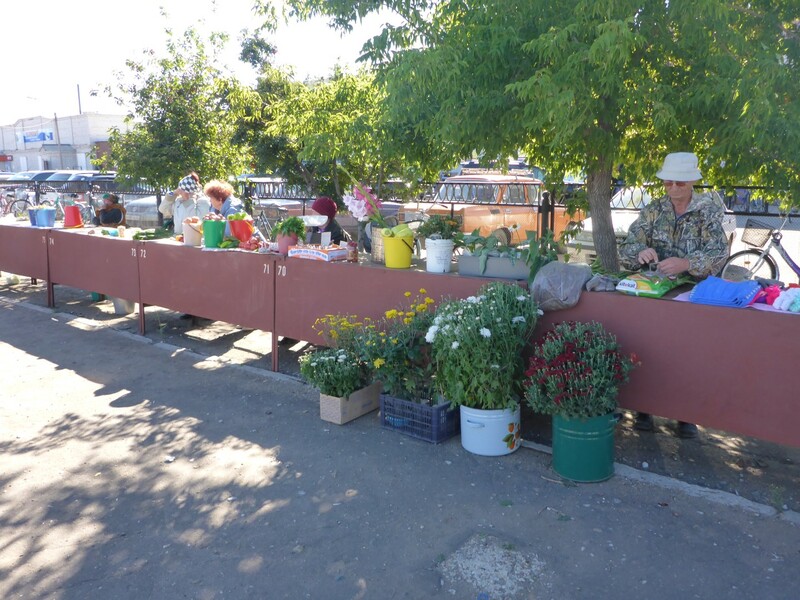 At various places along the road there would be people selling vegetables or fruit at the side of the road. Sitting on a chair behind a table or on a stool behind a couple of buckets, it seemed that every junction or bus stop was a scene of commercial activity, however small. I had no need for potatoes, onions or leeks so I wasn’t tempted. I stopped at a café for soup, bread and tea. A very nice place where the waitress took the trouble to introduce herself. That was a first. After a really pleasant day’s ride I eventually reached Novosibirsk, which came upon me in typical Russian style. The outlying areas of the Siberian capital mostly consisted of tin and wooden shacks, supporting typical ‘edge of town’ industries, with the buildings and businesses getting nicer as I went further in. I found the hostel I’d booked easily enough and a quick phone call got me through the locked gates. It was a small but nice place, with comfortable rooms where everyone spoke Russian except me. I felt completely at home. It was good to be back.